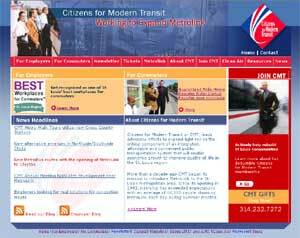 Launched yesterday was a new web site designed for Citizens of Modern Transit. The site was created to reflect recently redesigned print marketing material. The redesign also presented an opportunity to reorganize the site content and navigation to better serve the users. Distinct sections were developed for Employers and Commuters improving the overall usability of the site. Two blogs were also developed allowing the client to present their news and announcements as a RSS feed.